These geometric designs appeared on the pilots' doors of UH-1 Hueys assigned to the 1st Cav. When Cobra gunships were introduced to the gunship units, the logos were usually applied somewhere below the cockpit canopy. The 228th flew CH-47 helicopters and their company emblems were applied in various spots to their ships. Thanks to the 1st Cav veterans who helped keep me straight on the terms used by the various units! Although these units were "cavalry", the 227th, 228th and 229th battalions used the traditional Army term "company' to designate the component units of their battalions. In contrast, the 1/9 Cav used the cavalry term "troop". The 2/20 Armed Rocket Artillery used the artillery term "battery" for its component units. 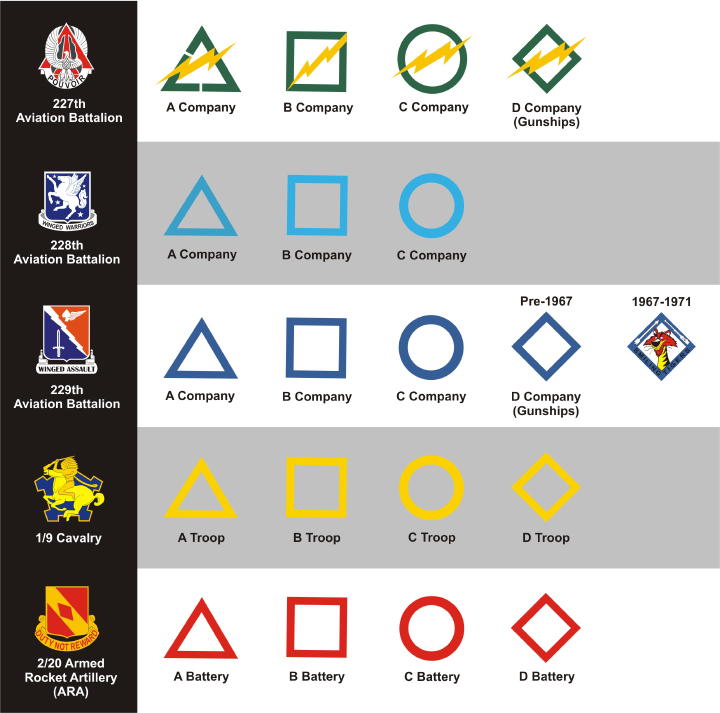 227th Avn Bn - As shown above, the 227th displayed a yellow lightning bolt through their company markings. 228th Avn Bn - The battalion had only three flight "companies". 228th ships usually displayed their company markings in flat black on the fuselage side, in black on the leading edge of the front pylon with the ship number in black painted inside the design (1970-71), and in flat white on the side of the rear pylon with the 1st Cav logo painted inside the design (1970-71). I have not seen any photo evidence that the light blue color designated for the 228th was ever used on their aircraft..
229th Avn Bn - The color designated for the 229th's emblems was called "dark" blue, but it actually appeared as a medium blue. The "dark" term was used to distinguish the 229th's color from the "light" blue designated for the 228th ASHB. D Company, the 229th's gunship troop, modified it's diamond shape in February, 1967. The company's call sign was "Smiling Tigers", and sometime in 1966 a member of the troop wrote to Walt Disney Studios asking if they could design a logo that incorporated an image of a fierce but smiling tiger. Somewhat to their surprise, in February, 1967 they received a package from Walt Disney Studios that contained a new logo displaying the Smiling Tiger graphic. This logo was used by D Company for the rest of the war. 1/9 Cav - This squadron did not have a separate gunship troop. Rather, the gunships were organized into platoons and each troop had its own gunship platoon.